'Liberty Enlightening the World’, which adorns New York Harbor is but one of three Lady Liberties. The original cast 'life size’ Statue of Liberty, at 15’ tall, stands in Luxembourg Gardens in Paris. A larger Statue of Liberty is a fifth of the size of our U.S. Statue and stands upon a parcel of land called Swan Ally in the Seine near the Grenelle Bridge. This Statue of Liberty replica was offered in 1889 to the French by the Americans as a remembrance to commemorate the Centennial of the French Revolution. The recent campaign for the presidency has brought to the fore a number of significant concerns regarding the fundamental rights U.S. citizens are granted in the U.S. Constitution. These concerns prompted the conception of my next series – The Liberties. In this series the three Lady Liberties will highlight that some fundamental rights are under duress and also remind that they are, indeed, fundamental and should never be assailed. 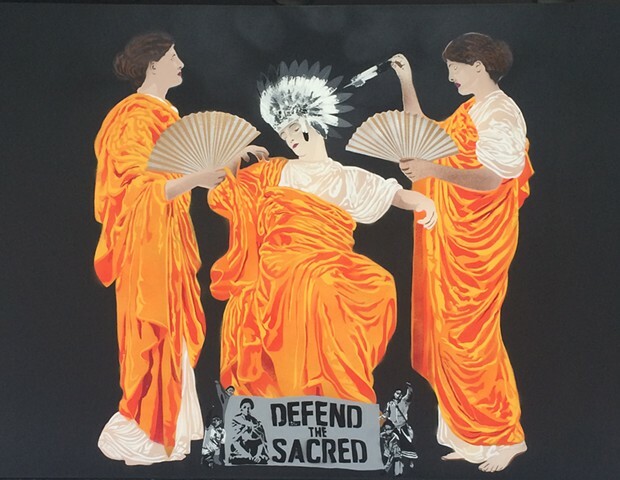 This first artwork serves as a capstone and I owe a debt of gratitude to Native Americans who, by exhibiting great courage in exercising their right to peaceably assemble at Standing Rock, reminded us all to ‘Defend the Sacred’. While their focus of defense was ancient burial grounds, their words spoke to a higher calling, as well, to the defense of our fundamental rights.